Bloating is a problem that affects many women, especially during menopause. In fact, around 20% of otherwise healthy adults experience bloating from time to time. This is often linked to food consumed and eating habits, though it is thought that shifts in hormone levels during menopause may also play a role. Fortunately, bloating can be reduced and prevented. Usually, natural means and simple changes in habit can help immensely or even relieve bloating completely. Chamomile tea is great for bloating relief. Chamomile flowers are anti-inflammatory and aid digestion while also relieving stomach pains. This warm, herbal tea also helps many people relax, helping to reduce high stress levels that could contribute to bloating. Dried chamomile flowers or teabags can be used to make tea. Moving around can help dispel the gas trapped in the digestive tract causing bloating. 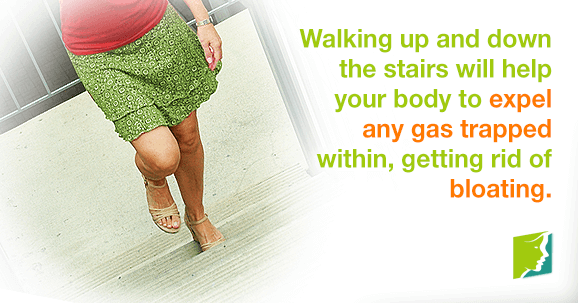 Taking a walk or going up stairs can make it easier for your body to expel trapped gas. Even mild exercise can help prevent the retention of gas and reduce bloating. Plus, exercise is beneficial to overall health and promotes efficient digestion. Although it is hard to detect when one is doing so, swallowing air can contribute to bloating. Eating quickly, talking while eating, drinking through a straw, and chewing gum can all lead to bloating. Additionally, sit down while eating without slouching to help digestion and reduce bloating. Smoking is well-known for its negative impact on health. Bloating is another reason to give it up completely. In addition to lowering estrogen levels, smoking is a known risk factor for bloating. While quitting may be difficult, there are now aids and support available to make the process easier. The bubbles in carbonated drinks can easily become trapped in the stomach, causing or exacerbating bloating. Try drinking water or fruit juice instead, which is also generally healthier in terms of sugar content. Using these natural remedies, you can reduce bloating and trapped gas. If you have severe bloating, especially accompanied by symptoms like heartburn and bloody stools, be sure to see a physician as soon as possible; in rare cases, bloating can signal an underlying condition. However, in the majority of cases, bloating is related to eating habits or menopause. Follow this link to learn more about how to treat other menopausal symptoms.